Numerous people have asked me to investigate how ear tips affect the frequency response of in-ear monitors (IEMs). Personally, I've not experienced much change in tone when changing from one tip type to another, but I've had plenty of troubles with ear tips in general. My left ear has a significantly more acute bend in it's ear canal than my right ear. Many times the ear tip bottoms out at the bend and the opening of the ear tip gets pushed against the wall of the canal occluding the opening and muffling the sound. Deep seating IEMs--like the Etymotic ER4P--often will put terrible pressure on the ear canal as it tries to straighten it out, which can be quite uncomfortable. Even custom molded in-ear monitors can be quite difficult to get into my left ear. What I've learned is that getting a comfortable and quality seal in my ears can be quite difficult. I've also learned that with care and experimentation most of these problems can be overcome. The biggest problem, it seems to me, is that most IEMs come with a limited selection of tips--usually just small, medium, and large round silicon tips. Sometimes one will work, and sometimes not. Fortunately, I've got a pretty big selection of tips lying about and I can usually find one that works. But for most folks, that's not really an option. Enter Comply. Started in 1990 by Dr. Robert Oliveira, Comply is a spin-off from work done at 3M. Dr. Oliveira is a specialist in the human hearing system and has done significant research in the changing shape of the ear canal with mouth movement. He came to the conclusion that dynamic memory foam is an ideal material for ear tips. At this point, Comply has developed a range of tips that will fit most commercially available in-ear headphones. I've found that the Comply tips are the most reliably comfortable ear tips available, and they provide excellent isolation. But I've also found numerous complaints online about these tips changing the frequency response of the earphones. I thought it would be cool to look into the effects of ear tip selection on frequency response. I decided to try three different headphones: the Etymotic ER4P, which seats deeply within the ear; the Monster Turbine Pro Gold, which doesn't sit in the ear very well as it's heavy and rather large; and the Audeo PFE Gold, which is ergonomically excellent and seats at a moderate depth. All these headphones perform fairly well, and I felt they should be responsive enough to give me good data. I measured these IEMs with all the stock tips that fit my dummy head, and the recommended Comply tip for each headphone. I should mention here that the dummy's ear canals, while acoustically very similar to human ear canals, are not physically like human ear canals. Human ear canals usually have a bend, and not perfectly round in cross section; the dummy ear canals are straight and perfectly circular in cross section. I think Etymotic has one of the better tip selections available, and I was able to use three different Etymotic tips. In the photo at the top of the page, the leftmost IEM is the ER4PT, and the tips used are below it: the silicon triple flange; the Glider, which is a dense memory foam; the less dense Etymotic memory foam tip, and the Comply tip. Here we can see in both the left and right ear measurements very little difference in response with the various tips. The notable exception is the triple flange tip which deviates in the very low bass, and at around 3-4kHz. The change in the bass response is similar to what is seen with the "main spring" effect on full size, sealed headphones. My guess is that the longer tube of the tri-flange type tip and its greater mass of elastic silicon create a mechanical resonance in the tip that causes the dip. Although these come with a wide variety of tips, I could only find two that would effectively seat in the ear canal of the dummy. Results of the left and right ear are a little mixed, but it's clear that the triple flange tip results are the most disparate. The Monster triple flange tip is somewhat larger and longer than the Etymotic triple flange, and has less support from the nozzle of the earphone than that of the Etymotic. The Comply tip does seem to slightly reduce the high frequencies above 10kHz, but I would say this is a relatively negligible amount. Certainly not large enough to account for some of the vehement complaints of loss of highs sometimes reported. The Audeo tip selection is small, and only one silicon tip fit the dummy. Here we can see the Comply tip had no effect on the right channel, and only a small effect on the left channel above 10kHz relative to the stock silicon round tip. It seems clear to me that the Comply tips are not affecting the sound substantially. In fact, it seem the triple flange tip types are more likely to cause changes in response. So, the question remains: Why do people complain of Comply tips sounding muffled? Originally I read your article @ work and cannot watch the video there due to filters... Any how I just got around to watch it and I'm satisfied with your explanation. It is my best guess that Goldenears might have muffled the sound similar to what you just described during measurements. My only concern with your advice for Comply tip insertion is that while it may improve the sound, the contact of the tube with the ear internals might cause some discomfort... What are your thoughts on that? Thanks for this Tyll. I've been curious about this subject for a while too. My experiences match your comments here as well. For the record, I use Comply tips with both my Westone 4s and TF10s. First of all thanks for educating everyone about this Comply tips. I do have the same angle in my left ear as yours. When I started using Comply TX100 (with ear wax protection) tips for my Phiaton PS200 earphones, they started SINGING and whatever the sharp high frequency peaks present were gone (even at high volumes). With PS200 beautiful soundstage I enjoyed ever single song I played. But lot of people even ljokerl said that using foam tips affect sound quality. And for me they were perfect. Please try it (as you have PS200 too). I agree with you @dondapatirc, I felt Comply tips improved the sound by removing high frequency pics. But Tyll, correct me if I wrong. I thought you said Comply tips have no effect on frequency response at all unless somehow the tip of the Comply tip collapses and blocks the tube output... right? I guess we have to avoid pushing the tip too far into the ear, or somehow avoid the tip to collapse once inserted as per the video. The measurements show a very small change in the highs in some cases, but it seems pretty minor to me. If it does reduce it a tad, I'm cool with that. I 100% agree. Even when improperly inserted, to say that I love the sound of my PFEs is an understatement. I stopped using my Audeos for sometime because I didn't know how to use them in the first place, and probably hurt myself a few times by pressing both the silicon and Comply tips way too much into my ear canal, and by not properly removing them, subjecting my ears to all kinds of pressures. During playback I didn't have problems. But 10 min after removing them it felt as if I had water inside my ears... for days! I'm OK now, but IMHO IEM have a user learning curve for sure... And this article further shows it. The obvious benefits are IEM have amazing sound for the price... Even a noob like me can vouch for that. Again, Thank you for sharing these not so obvious tips on how to make the most of our gear. i wouldn't rule out placebo in the perceived change due to comply tips.. as NwAvGuy so often reminds us with science, bias and placebo are very real in our world. Comply tips are soft, and squishy, the "look" like they would muffle the sound, so some people may create the muffled sound with their expectations. This is an excellent point, and I think a rather likely explanation for why the idea is so prevalent. You could see these articles. In Tyll's measurement, we cannot see any differences between ear sleeves. If some differences exist, they are little significant. However, I feel the differences, specially, between Triple Flange and Black Foam. I think the effect of chainging ear sleeves in IEM is effected by his or her ear canal shape also. So, not only ear sleeves but also the shapes of the coupler contribute to frequency response data, I think. Indeed, Comply tips seem to cause a bit less resonances than most silicone, both at low and high frequencies. It's usually really not an issue, in fact beneficial if the resonant peaks are in odd places (e.g. natural ear canal resonances at 3-4kHz, 7-8 kHz). In case of the VSonic, it's enough to drop it from "sibilant" to "touched up presence". UEs are improved a bit less and are still highly annoying. I'd attribute that to increased Vas of the ear/IEM system (same reason why foam is sometimes used in speakers) - this should be most relevant for vented and closed IEMs, more noticeable with larger dynamic driver based ones, like your Monster. Frequency response is not the whole story - care to run a THD test? This should show a measurable difference if I'm right, especially in bass. At least with the etymotic and monsters, the foam tips seem to reduce the 3-4khz "peak". Not so sure about the Phonaks. Actually, the ear is more sensitive in the 3-4kHz region supposedly because it's an average child voice frequency and 7-8k region is used for speech, leaf rustling and various other important natural sounds. Both were an evolutionary advantage. The actual frequency response at the highest end (>4 kHz) is quite individual and dependent mostly on external ear shape, but typically contains at least higher sensitivity regions. Good headphones and IEMs should produce sound that has similar frequency response to a source in either free or diffuse field (I prefer free field) at some meters (I'd pick 3) in front dead ahead. Of course any added resonances are detrimental for such a design. The other way is to tune the whole ear/headphone system to sound flat, but this either requires expensive in-ear probes and statistical data or a very good measurement "ear model", similar to the one Tyll uses. I use equalization to achieve something similar with very good results by using averaged multiple measurements by ear over longer period of time. Multiple parametric equalizers with a wide Q range (up to 6 at least) are best for this adjustment. The whole process is pretty time consuming. Headphones are actually harder to design well, since they must take outer ear into account, esp. positioning of the driver. In case of closed headphones, high frequency resonances are very hard to avoid, since there's a lot of air moved and not enough space to put absorbing material. IEMs face a different challenge: it's hard to produce a tiny driver that can create enough bass and be fast and light enough to produce very high frequencies. The obvious answer is to combine more than one driver. Best dynamic drivers are pretty wideband of course, RE272 can do 22Hz to 18.5kHz - but non-linear in wrong ways. Getting rid of the resonance is typically easier than in headphones due to lower pressures involved - the best such system known to me is the material used by FutureSonics in their Ear Monitors. IEMs are always resonant in some way, because they have to maintain a seal with the ear canal to attain necessary high efficiency. That doesn't preclude making an open back IEM (with less resonance), but of course the isolation will be abysmal. Most IEMs are of vented design. Balanced armatures produce far less resonances due to radiating sound 90 degrees to the side and possibility of mounting them in positions closer to optimal due to small size. A similar trend in new dynamic driver designs is also to mount the driver 90 degrees tilted (e.g. Sony MDR-EX1000, Spider RealVoice) or 45 degrees tilted (HifiMan RE272). "bandlimited noise might be slightly more faithful but I haven't got around to synthesizing these." In the design, characterization, and use of digital communications systems, generating sequences that behave as white noise is of extreme importance. In fact, they are key and heavily used in modern communication systems for the purposes of timing recovery, channel estimation, and error correction... I you want an example of a relatively complex digital communication system used heavily in audio: the CD player. 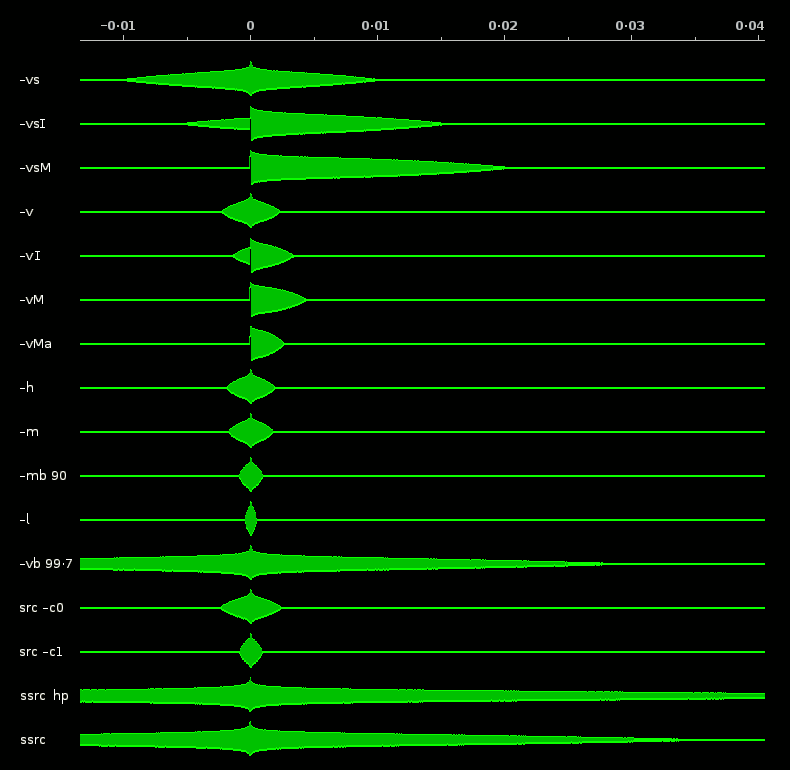 This sequences have been used to derive impulse and frequency response of twisted pair. One thing to be mindful about characterization of a system, is that bandlimited impulses will have a sync like appearance in time domain. For example, the Shure 535 impulse response, and square waves in Tylls plots show this ringing on the front and back of the waves. This maybe due to the response of the ear phone, but this ringing is what you would expect in the characterization of an almost perfect headphone due to the fact that both the headphone and the measurement system is bandlimited. The only thing you can do is control the ringing by windowing with something other than a sharp rectangular frequency mask. A very sharp frequency cut will yield a ton of ringing. Almost no ringing will mean a slower roll off at the corner frequencies. The main reason is that the sine is not affected by any IMD and less affected by THD, so the higher harmonics will not be heard during the equalization if there are any as opposed to one done with a more complex signal. Low pass filters: I'm really not an audio low pass filter guru. But I know a one or two about some of them :) How good a low pass filter is depends on what you are trying to accomplish. I've used mostly IIR filters because they are practical. However depending of what you use, they can mess up your phase. I use mostly Butterworth 5th order. Butterworth filters are maximally flat in the pass band with a 20dB/decade after the cut-off (EDIT: 20dB/decade/order i.e. 5th order Butterworth will have 100dB/decade... UPS!). They don't mess up the phase that much. I have used Chebyshev filters which are more flexible than the Butterworth as they allow you to trade off pass band flatness for roll-off (better than Butterworth). For certain Delta-Sigma applications I have preferred using Bessel since these are the ones that affect the phase the least out of the IIR filters I mentioned. But their roll-off is really slow (worse). If you want to get as close as possible to a brick-wall, then Elliptic is the way to go, though you are going to pay the price in the phase response... Analog Butterworth filters are used quite a bit before sampling (ADC) to avoid aliasing. For anti-aliasing in the digital domain, CIC filters are used quite a bit... They are really nice implementations of a classical averager but with only an added and subtracter (need feedback). Since an average DOES NOT have flat pass-band, compensation is used in the last stage. What I find interesting about the Shure 535 is that it's response has a slight ring at both edges of the impulse response... almost looking like a Sinc... You don't? Then look at those square wave responses having the same small ring at both edges! How the hell did they did that?! EDIT: I think I know where you are coming from with the Aliasing :) ... I DON'T think the ringing is due to the measurement equipment or aliasing. NOT AT ALL. I believe that is probably as close as an impulse response model of the headphone as one is going to get. The POINT IS, the Shure 535 looks A LOT to what (I would expect) an ideal headphone might measure in the time domain: A Sinc or a type of a window function. Why? Because if you want flat frequency response from 0 to x kHz and then nothing after that is exactly what you are going to get. That may not be what you want though due to the ear gains here and there (I'm aware of that too). Back to the Shure 535 the uncompensated frequency response is almost flat down to 1kHz and a smooth slight bump from there onto 8kHz. Some more minor ringing and kind of brick walls at around 12kHz only to come backup slightly around 16kHz. I think that strong decay at 12kHz coupled with very deep low frequency extension gives rise to the ringing in impulse response both before and after the main lobe, which in turn give rise to those interesting looking square waves... Just a theory. The ring in Shure SE535 response is not at all due to bandwidth limitation of the driver, but due to lack of enough electrical damping in its balanced armatures - that is actually quite common in the small drivers such as ones used in headphones. Far less common in larger dynamic drivers, since they have some mechanical damping and in certain designs "air braking" is important as well. Shure's ringing is reasonably low in magnitude and acceptable, in comparison to e.g. Etymoic ER4PT. However, Audeo PFE 121 (w/ Green or Black filters) and even Klipsch X10 beats it hands down. There *might* be added ringing in the crossover region between its two drivers due to the crossover - but there's not in this case, as it uses a nice third order Bessel (12 dB/oct) crossovers - easily seen in the phase response - with the low end driver having a knee frequency of 800 Hz and high driver using knee frequency of 4500 Hz. IIR filters are very hard to do right in comparison with FIR filters. You trade phase distortion, amplitude distortion and tranisition only. In FIR, ringing and aliasing can be traded as well. Remez exchange filters are nice in impulse response and but relatively slow transition. It doesn't matter in which domain (digital or analog) you do the filtering as long as you do it before final sampling at wanted bandwidth. "The ring in Shure SE535 response is not at all due to bandwidth limitation of the driver, but due to lack of enough electrical damping in its balanced armatures"
Interesting. I guess is hard to fit damping in such a small structure. I don't think the ringing is due to just the bandwidth of the armature. I think is related also to the VERY step cut off of the whole system. The steeper the cut-off the more ringing I guess. "There *might* be added ringing in the crossover region between its two drivers due to the crossover - but there's not in this case, as it uses a nice third order Bessel (12 dB/oct) crossovers - easily seen in the phase response - with the low end driver having a knee frequency of 800 Hz and high driver using knee frequency of 4500 Hz." BTW, AGAIN nice catch on the phase response reading! I kind of agree with you on that Bessel filtering and order stuff @ the cross-over! Really good one! Make sure you're not using too large size for your ears. I've had similar effect with RE272 when using medium ones - the foam tended to block the sound. http://www.digizoid.com/. The digiZoid2 sub is a gem for solving that issue. I know, I know, "purism", but if you can MOD an HD800, why not? Thanks for the effort, care, and concern which goes into Innerfidelity. Your work is appreciated. Thank you dude! Really cool! Thank you dude! Really cool! I MAY ACTUALLY BUY THE ZO!!! Again Thank you! Thanks very much for the informative and entertaining look at the Comply tips, Tyll. Your video about how to prepare them for insertion gave me the answer to why the gray foam tips (cylinders with squared-off ends, third from left in your picture at the start of the review) work so well for me with my Etymotic MC3s and HF5s. Since the foam doesn't project beyond the end of the sleeve, even after being rolled tightly before insertion, there is nothing to block the end of the sleeve when it makes its way around and through bends in my ear canals. Although the EOM gray foam tips from Ety are very comfortable for me - and don't seem to interfere in any way with the music I hear - I still might give the Comply tips a try. Maybe Santa will bring me a set next Xmas. He needs to, because the two lumps of coal he left me this year are NOT at all comfortable in my ears - and I haven't had much success connecting them to my headphone amp! Thanks again! I really enjoy your web site and I frequently rely on your insights and opinions to help me make decisions about equipment. Comply TS series are a nice new spin on the basic design, quite a bit more comfortable to my ears. Unfortunately, they don't make these in small size yet, so I can't use them with any of my IEMs without high frequency rolloff. Complys do wear out. I assume that something leeches, either in or out, over time. When they're done, they won't sound quite right. It might be just a matter of losing seal or it might be something else. Ear canals can be very different from person to person and even from ear to ear. What works for my funnel-shaped ears my be completely wrong for yours. You might need different sizes for each ear, even. For whatever it's worth, with my ears and my IEMs, Comlpys and the Shure back olives have yielded the best results over time. They sound (and feel) a little different, with the black olives being bassier and punchier and the Complys being smoother, with a more articulate midrange. Moving the tips up and down the nozzle, or wearing them forwards or backwards or whatever seems to change the sound somewhat. So I'm quite ready to believe that the shape of the end of they tip (after being squashed in your ear) is important, even if you don't go so far as to squash it closed and block the nozzle. I came to headphones via earphones and have done my share of tip swapping. This didn't seem to affect the sound of the earphones. I used to frequent the portable and earphones threads at Head-Fi, and was bemused by the obsession with ear tips and some of the extraordinary claims that were made regarding how radically they changed the sound of earphones. I was sceptical as this hadn't been my experience. However, there was an occasion when I changed a foam tip for a silicone tip and the latter altered the sound of the earphone significantly, and not for the better to my ears. Consequently, I'm not as dismissive of these claims now. I came to this website right about time, right now I am trying to chose perfect earphones and this was very curious for me to read, I hope that this post will help me to get my perfect ones! I just love listening to music while working with photo editor as I am a photographer, for me it is such an inspiration! I almost sent back my HF2's due to squelching and pain in my left ear. It turned out to be ear wax build up. I'm actually relatively young, so I was a bit surprised. Any way it turns out that this is an issue for half my friends also. A lot of them have had their ears done, which I hadn't known about. I thought it was an issue only for the very old. Even Shures can given problems; and they aren't that deep. Etymotics should tell of this to avoid losing customers. I had my ears syringed and -> Audio bliss. It also cleared up a long-standing pain that sometimes affected me when sleeping with my ear on the pillow. And when I swim my ears clear immediately whereas before it could take some time. I use a thermometer to make sure the water is at a safe temperature (38C) to avoid burning my eardrum. Comply foam tips are not durable and there are many varieties of foam tips that may be used. Earsoft also made by 3M are cheap; much cheaper than Comply and can be easily made to fit almost any IEM. thanks for the article, it's great to see someone applying reasoned enquiry to a neglected but quite common aspect of IEM ownership and use. Before I read your article I was convinced that Comply (or similar compliant foam tips) do reduce resonance. With my Shure SE215 or Sennheiser CX95 IEMs I don't notice much sound difference between foam, triple/double flange and regular silicones, but with my Klipsch Image X1 IEMs I remain absolutely sure that Comply tips improve things a lot by reducing the awful leaden booming. The two immediately obvious differences between the Klipsch and the others are that the Klipsch bass is both more emphasised and more resonant (booming/muddled) and that the Klipsch silicone tips are *a lot* harder than the Sennheiser or Shure equivalents. I have no experience of Etymotic, Audeo or Monster 'phones or tips so I don't know if I'm saying anything relevant or pertinent or simply recycling unfounded impressions. The one thing about foam tips that I do know beyond a doubt is different is how well they negate bone conduction. I often listen while out walking and if I use foam tips I hear the music, but if I use silicone tips I hear the music overlayed with the thudding footsteps of a 16 stone lead footed ogre. I prefer foam tips. Tyll, if you have the chance, do try the newer Ts series with the spherical foam. It pretty solves all the issue on insertion. I don't even need to compress the foam when inserting the IEM and it works just as well. Thanks for the tip (literally), I'll check them out. I prefer the old beige ones for their comfort, durability, and reliable seal. The newer gray ones are too hard. I like the memory foam half spheres for their ease of insertion and further comfort, but they don't last very long and their seal tended to get unreliable rather quickly. Even though I can usually continue to get bass, it seems less than the beige flanged one. I get repeatable, deep bass quite easily with the beige ones and other than some itchyness when they or my ears need to be cleaned, find them comfortable enough. I do not enjoy having to remove and re-insert them, though. Once they're in, I'd rather leave them there. Though I can get the bass just right without having to worry if they've worn too much yet (since they don't), it takes a few tries and effort to get the same depth on both ears. With the foams, if they're new it takes one try and re-inserting is not bothersome if something comes up. The biggest issue with the beige ones is as they age they can get slippery and come off the stem. So I keep a pair of tweezers in my ety baggy to gently and carefully grab hold and pull them out by the flange. I was pretty freaked out the first time that happened. Will any of the Ts fit the Phonak PFE? You can try the one for Apple dual driver IEM. It is not a Ts series but it does have the same shape. Effect of tips for the IEMs on the frequency response. I would like to thank Tyll for taking the time for this review of silicone and Comply foam tips. In search for better response from certain IEMs that are otherwise to my liking, but deviate towards brightness or lack/excess of bass by not too much, but just to be annoying enough, I stumbled upon Ostry OS100, OS200 and OS300 tuning tips : http://www.shenzhenaudio.com/ostry-os100-os200-os300-earphone-turning-ti... The frequency response in which they affect Ostry's own KC-06 IEMs is shown at the bottom of this page : http://www.ostry.cn/item/detailPage?itemid=28 I have tried these three different tips and they generally behave the way the graph says. Would it be possible to measure these tips, as IMO this could be helpful to lot of people, who would like to modify/control the frequency response of their IEMs just that tiny bit in order to be truly satisfactory. The description in Chinglish does not justice to these tips; "dental correction" should more properly read "peak reduction" in the treble (as those peaks very loosely can resemble teeth in the graph...) and "catheter" should read "nozzle" - lost in translation is something definitely going on in this case.